Inter-institutional and interdisciplinary research has become an increasingly popular and important area of study as funders, tenure committees and others seek to better understand the work of faculty, staff, students, postdocs and other researchers. While this is still an emerging area of inquiry, one thing is clear, there is much to learn about how researchers research. In the case of scientists, what they discover about the natural world is often shaped by the social networks that define their lives. Their ability to advance knowledge is dependent upon their access to subject matter experts, funding, or equipment. To make progress in science, researchers need access to methodologies or knowledge they have not used before with support from their departments and institutions. As third party evaluators, we seek to study the connections made between these different stakeholders. The primary goal of BEACON is to unite biologists, computer scientists and engineers in a joint study of natural and artificial evolutionary processes to solve real-world problems (BEACON Strategic Plan, 2013). BEACON collects self-reported output data from its members for annual reports. 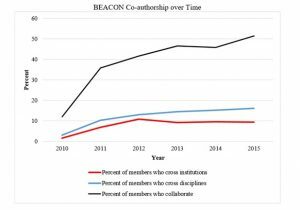 For example, BEACONites have reported 849 BEACON-related publications since the start of the Center in 2010 (BEACON 2015 NSF Report) but the data do not provide insight into the structure of BEACON collaborations between disciplines and institutions. 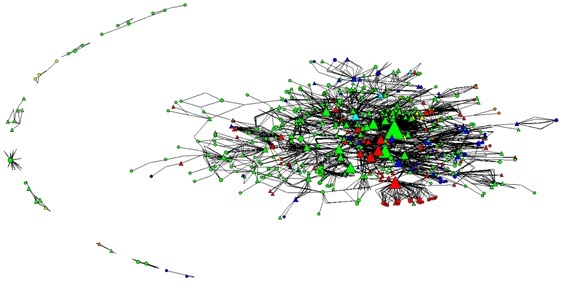 In our recent evaluation of BEACON we elected to use Social Network Analysis (SNA) to study the relationships and outputs of the BEACON members by roles, institutions, and disciplines. 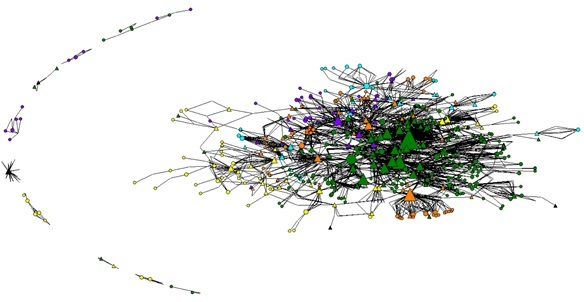 SNA involves mapping and measuring relationships and information networks between individuals, groups, organizations, and other connected units. We set out to explore who participates in cross-boundary collaboration and which types of boundary crossing BEACON participants engage in with regularity. We used NetDraw, a Network Analysis program, to create sociograms showing the co-authorship ties in BEACON and statistical analysis through SPSS to identify which member attributes were correlated with co-authorship. The sociogram below shows co-authorship between BEACON members who collaborate within the Center. Triangles represent members who collaborate inter-institutionally; circles represent members who collaborate only within their institution. 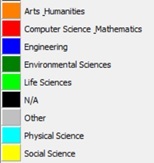 Colors delineate institutional affiliations as displayed in the key. The size of the shape representing each member is dependent on the number of collaborative outputs they produced. In general, BEACON members tend to collaborate with people from their own institutions more than they do with those from other institutions. In the sociogram below, triangles represent members who collaborate interdisciplinarily (meaning researchers conduct research with those in other disciplines) and circles represent members who collaborate only within their discipline. In contrast to the clustering by institution above, collaboration across disciplines is much more intermingled. Most interinstitutional work is also interdisciplinary, but most interdisciplinary work involves only one institution. 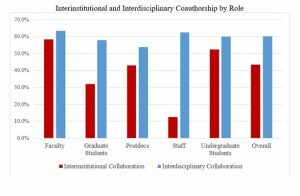 Individuals who work on interdisciplinary projects are more likely to cross institutional boundaries, and vice versa. Looking at graph on the right, interdisciplinary work is more than twice as common as inter-institutional work. 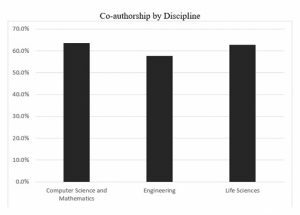 In addition, interdisciplinary co-authorship is growing at BEACON while inter-institutional research appears to have reached a plateau. Scholars at NCA&T State were least likely to collaborate among all the BEACON institutions. Scholars at NCA&T State are the most likely to engage in interinstitutional collaboration with other Center members. 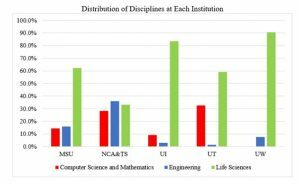 Scholars at NCA&T State are also the most likely to engage in interdisciplinary collaboration, which may be a result of being the only institution in the STC with nearly equal distribution of members from all three of the center’s core disciplines: life sciences, computer science, and engineering. 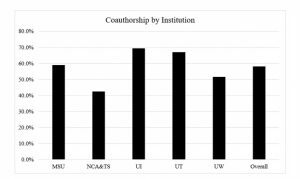 Differences in collaboration practices tend to be dependent upon institutional affiliation, but researcher discipline did not reveal any patterns in collaboration. Members of all three core disciplines participate in collaboration and interinstitutional collaboration fairly equally. 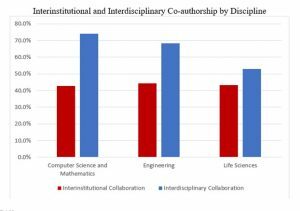 Members in the life sciences are least likely to collaborate interdisciplinarily. This may be because so many of the departments involved in BEACON are classified as life sciences and they may be collaborating with members in other life sciences departments. A greater proportion of graduate students and postdocs collaborate than faculty. 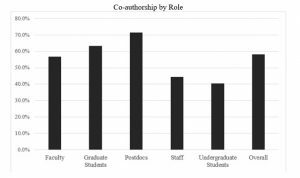 A smaller proportion of graduate students and postdocs collaborate inter-institutionally. 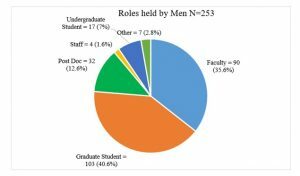 Although there are more graduate students than faculty members in BEACON, the majority (54%) of collaborations involve at least one faculty member and at least one graduate student. In total, 38% of collaborations involve multiple faculty members and only 6% of collaborations do not involve faculty members. 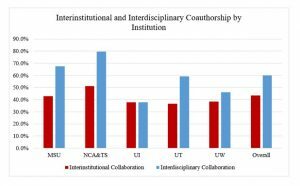 The majority (62%) of interdisciplinary collaboration and the majority (65%) of inter-institutional collaboration involves multiple faculty members. Of BEACON collaborators whose gender was known, 38.4% are women. Women are somewhat more likely than men to collaborate within BEACON. A higher percentage of men who collaborate within BEACON do interi-nstitutional work than women. In addition, a higher percentage of male BEACONites participate in interdisciplinary collaboration than females. 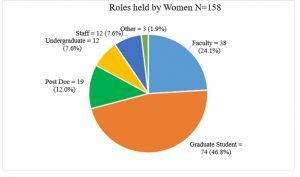 The reasons for gender differences in collaboration is an area that requires further exploration, and could include factors such as representation within faculty rank, discipline, and role within BEACON since such a high percentage of women are students and staff. Non-U.S. citizenship and permanent residency do not appear to be barriers to collaboration within BEACON. Non-U.S. citizens tend to collaborate less interinstitutionally while permanent residents do not have the same problem. Non-U.S. citizens are less likely to participate in interdisciplinary collaboration within BEACON than U.S. citizens or permanent residents. 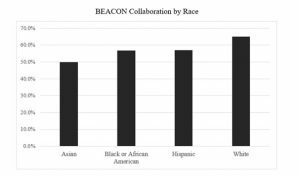 A lower percentage of Hispanic, Black, and Asian BEACONites participate in collaboration within BEACON than White BEACONites. 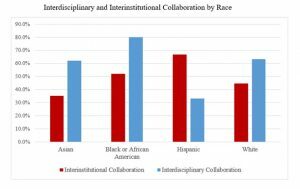 For members who collaborate within BEACON, Hispanic and Black members tend to collaborate between institutions more than White and Asian members. Black and African American BEACONites are more likely than White or Asian BEACONites to collaborate across disciplines within BEACON. Hispanics are less likely than Whites or Asians to do so. Sixty percent of the African Americans are at NCA&T State which could explain why they are more likely to do interdisciplinary and inter-institutional work. What explanations do you see for these patterns? How could BEACON encourage more boundary crossing? This entry was posted in About BEACON, BEACON Researchers at Work, BEACONites and tagged BEACON Researchers at Work, Inter-institutional, Interdisciplinary. Bookmark the permalink.